This past Monday and Tuesday Brian and I took the kids on a surprise road trip for Spring Break. It was Brian's idea, I think he is feeling guilty about us taking an adults mini vacation next week. Brian had to go a doctors appointment on Monday morning and hotel check in wasn't until 3 so we left early afternoon. 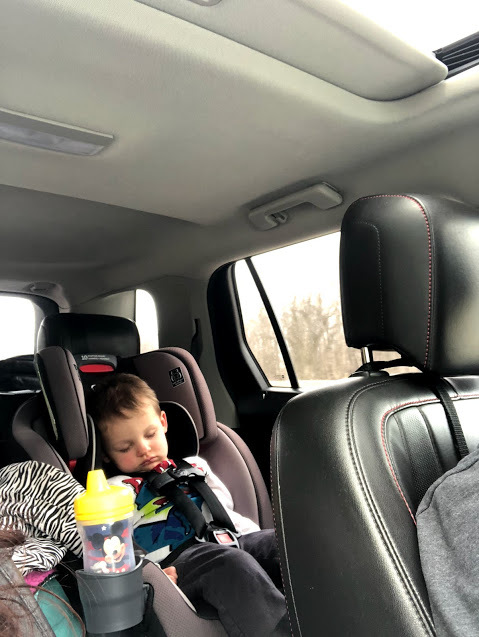 It worked out great that I kept Austin up from his nap and he slept most of the time in the car. Can you see the excitement in his face. I promise we are excited for the kids surprise too and just to get away. 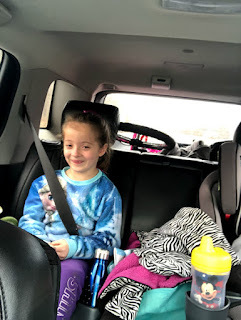 Ella was excited and kept asking where we were going. She knew swimming was in the future because she saw that I packed the life vests. Ella was a wonderful back seat driver. We would point out different rivers, and mountains, clouds, fog, buildings... 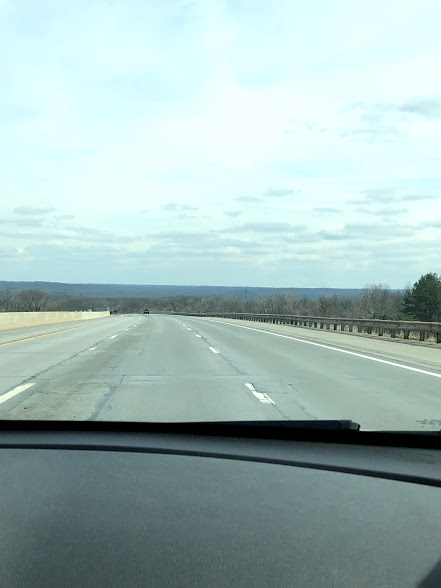 Her response to this view was "OMG it is so beautiful it is like we are on top of the world". 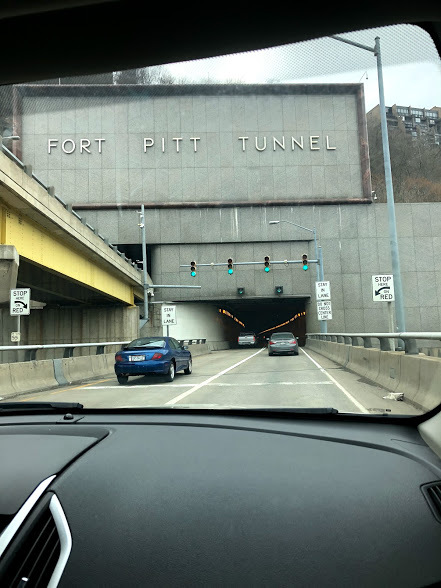 Time for a long tunnel. I use to love tunnels as a kid, not so much as an adult. 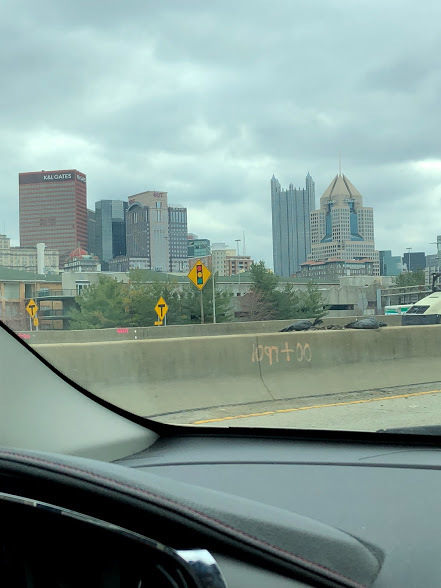 I also hated Pittsburgh traffic. I may complain about downtown Cleveland traffic, but I will take it any day over crazy Pittsburgh drivers and crazy lane changes and mountain roads. 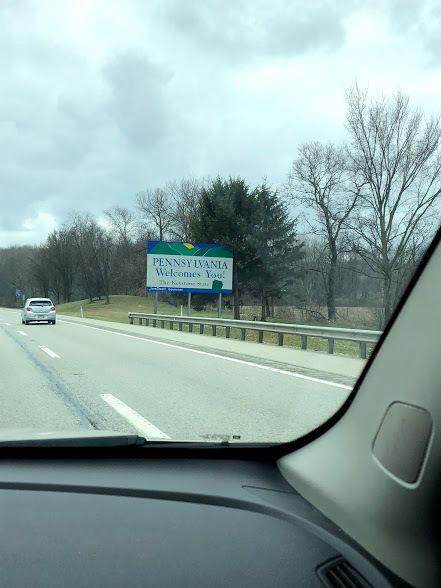 We got to our hotel right outside Pittsburgh around 4pm. Both kids were getting hungry so we decided to check in, unload the car, and find somewhere for dinner. It was rush hour, our hotel was by an industrial park and not much around. We went driving around for a good 30 minutes then finally found an Applebees. Our server was wonderful, but the time to get our food was slow and the kids were antsy. Not a very good going out to dinner experience. Surprise #1 swimming. We picked a hotel that had an indoor pool. The plan was to swim for the evening. The hotel had a pool and hot tub. In the summer the pool is inside and outside. Due to this I believe they have problems keeping the indoor pool warm. 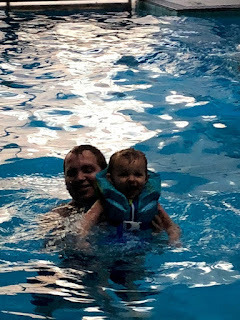 We lasted about an hour in the pool. The kids lips were starting to turn blue from the cold, means it was time to get out. Even though they were having lots of fun and didn't want to get out. Sometime I have to be the mean mom. 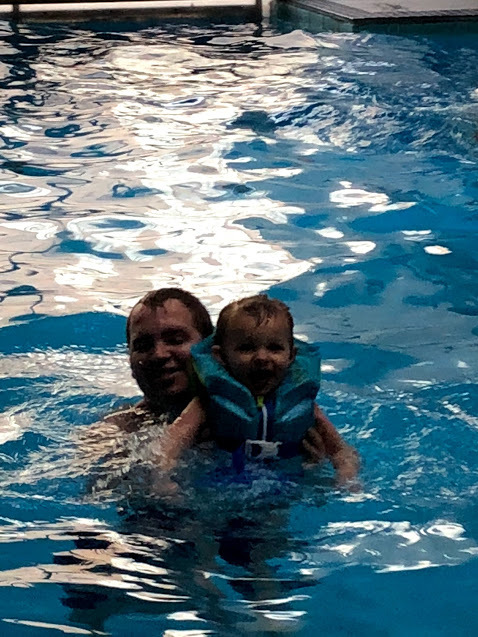 Both my kids love the water and have no fear, which is scary. We ended the night playing the longest game ever, at least it felt that way, playing War. Ella ended up winning without cheating. Then we cuddled, watched Disney Jr on the tv and fell asleep. Girls were in one bed and boys in the other. I was hoping the kids would sleep together but Austin had other plans, he wanted his dad. A mom can dream. Day 1 was lots of fun. 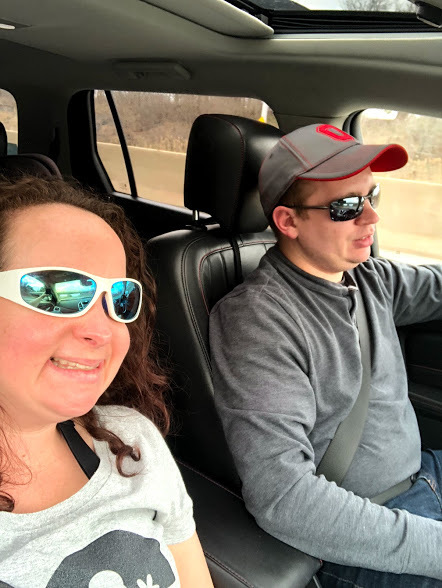 Check back next week for Day 2 of our mini getaway and the big surprise.